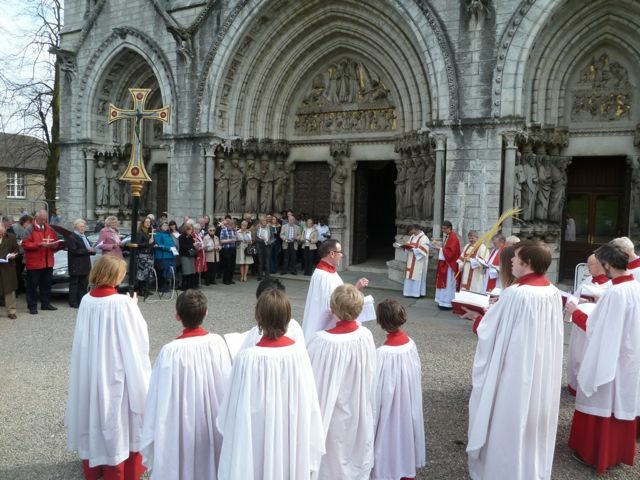 In common with Christians throughout the world, the people and parishes of the Church of Ireland Dioceses of Cork, Cloyne and Ross are preparing for the start of Holy Week tomorrow, Palm Sunday, 13th April, 2014. From the earliest centuries of the Christian movement, disciples of Jesus Christ have retraced the lats days of his journey, from his entry in triumph to Jerusalem (Palm Sunday) to the Last Supper (Maundy Thursday), his trial and execution (Good Friday), his burial and the resurrection on Easter Day. The parishes of these Dioceses have full programmes of Services and ceremonies to serve as collective memory of those events at the heart of Christian belief. There are walks and talks, early starts and late finishes, dramatic liturgy, Stations, reflections, proclamation, silence and waiting, themes and visiting speakers. Kinneigh (near Ballineen) at 10.30 a.m.
Douglas: at 3 p.m. Douglas Churches Together invite you to meet at Douglas Community Park for their walk around Douglas village with stops for reading and prayer before proceeding to the Douglas Court Shopping Centre and the Douglas Village Shopping Centre where display stands will be opened. These stands will be staffed by local Christians throughout Holy Week and a box for prayer requests is made available to shoppers. Later tomorrow, in Clonakilty at 7.30 p.m., starting at Kennedy Gardens, you are invited to the Three Churches Ecumenical Palm Sunday Procession. This entry was posted in Church Services, Diocese, Holy Week, Special Events. Bookmark the permalink.